Demonstrations attended by hundreds of people celebrating the one-year anniversary of right-wing PEGIDA’s local Leipzig branch were marred by violence, as dozens of hooligans thrashed foreign-owned shops, while massive counter-protests were staged nearby. Dozens of “neo-nationalist” rioters were arrested by police in Leipzig after rampaging through shops in the Connewitz district, RT’s Harry Fear reported on Twitter. A report by BILD said that some 250 hooligans taking part in the riots were right-wing football fans that had planned an attack on the HQ of local football club Roter Stern (Red Star). The club is known for its activism against right-wing extremism. While on the way, the mob broke windows in shops and restaurants, crushed mull containers, and stormed a bar frequented by Roter Stern fans. More than 100 of the rioting hooligans were reportedly rounded up and arrested by police, while dozens were arrested elsewhere in Leipzig on Monday night. Earlier on Monday, thousands of demonstrators took to the streets to celebrate one year since the founding of the right-wing LEGIDA movement – Leipzig’s branch of Dresden’s anti-immigration PEGIDA. From 1,500 to 2,000 people joined LEGIDA’s “anniversary demonstration,” BILD reported, citing witnesses. The protesters gathered in the square in front of Leipzig’s Natural History Museum. According to the rally’s organizers, about 3,200 people turned up for the event. Lutz Bachmann, one of PEGIDA’s founders and the movement’s current leader, also attended Monday’s event, but delivered only a short speech, according to the German media. The rally was also attended by Tatjana Festerling, who had been PEGIDA’s mayoral candidate for Dresden. 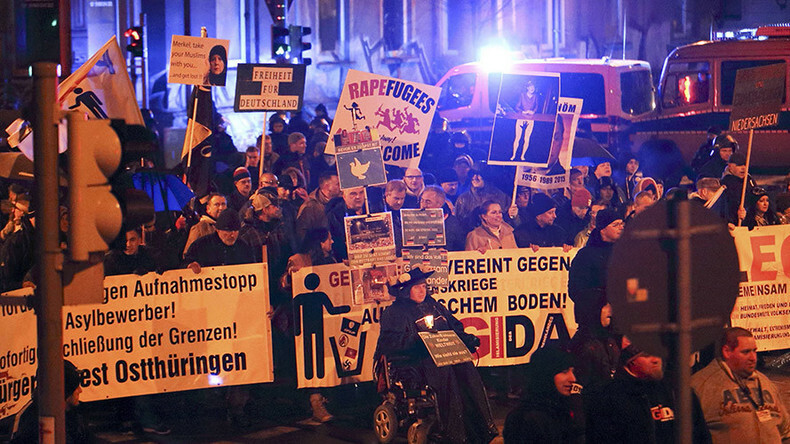 The protesters chanted slogans such as “Merkel must leave!” and “No refugees!” RT’s Fear reported from the scene. The rally’s speakers addressed the New Year’s Eve sexual assaults in Cologne, denouncing them as “asylum seeker criminality,” as well as leftist violence. Meanwhile, a great number of people joined massive counter protests staged in the immediate vicinity. According to BILD, as many as nine counter protests were planned in Leipzig with about 2,300-2,800 people joining the antifascist rallies. Scores of police officers were deployed around the city, with helicopters monitoring the major protests venues. The police, who pledged to prevent any clashes, also had several water cannons at the ready. Before the rallies, about 850 people joined in a “peace prayer” at one of the Leipzig’s churches, with hundreds later forming a “a chain of light” (Lichterkette) – a human chain of people carrying candles in the city center. German media reported that the people were showing their support for tolerance and peaceful co-existence through this act. The event was supported by representatives of major German political parties, including the Social Democrats, the Greens, and the Left, as well as trade unions. Leipzig’s mayor, Burkhard Jung, called on “every local resident” to take part in the ceremony staged under the slogan “Leipzig will stay light-filled.” Saxony’s Justice Minister, Sebastian Gemkow, also took part in the event, German MDR reports.